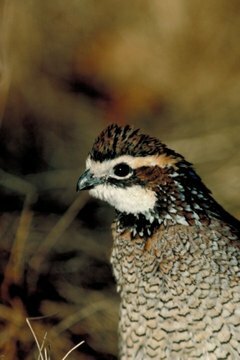 The small stature and docile disposition of the bobwhite quail make them an ideal bird for novice or seasoned bird owners. Bobwhite are dedicated brooders, sitting on their nests faithfully from fertilization through hatching. Brooder boxes are a must for newly hatched chicks, as the bobwhites’ small size makes them vulnerable to the elements. Building your own brooder box will keep your bobwhite hatchlings safe and secure until they're large enough to fend for themselves. Wash a large plastic storage tub to remove debris and residue and turn it upside down on a towel to dry. Scrub the lid and set it aside to air dry. Bobwhite quail are particularly sensitive birds and can be sickened by even trace amounts of chemicals in unwashed tubs. Tear a section of old newspaper into strips and line the bottom of the dry storage tub with a layer of the paper. The paper should be at least 2 inches thick to provide adequate footing. Bobwhite chicks are prone to bone disorders such as leg and joint deformities if forced to walk on unpadded surfaces. Set the heat lamp bulb-side down over one corner of the lid and draw a circle slightly larger than the bulb. Cut out the circle with a sharp knife and set the lamp down inside the hole. The small body size of bobwhite chicks will quickly lead to hypothermia without a constant heat source. Place a shallow bowl in the center of the box and add a handful of marbles to the bowl. Fill with an inch or two of water and scatter a layer of chick starter around the bowl. The marbles allow the small chicks to climb out of the bowl if they fall in without the risk of drowning. Move newly hatched chicks to the brooder and cover the box with a lid. Plug in the heat lamp and keep the chicks in the box for four weeks, or until they’ve grown a full set of adult feathers. One 20-gallon storage tote is large enough to house approximately 24 bobwhite quail chicks. Replace newspaper every three days to keep your brooder clean and cut down on odors.